Whoa, that was quite the game on Sunday! Liam & I snoozed through the first half (we didn't miss much), but were up for all the excitement in the second half and overtime! 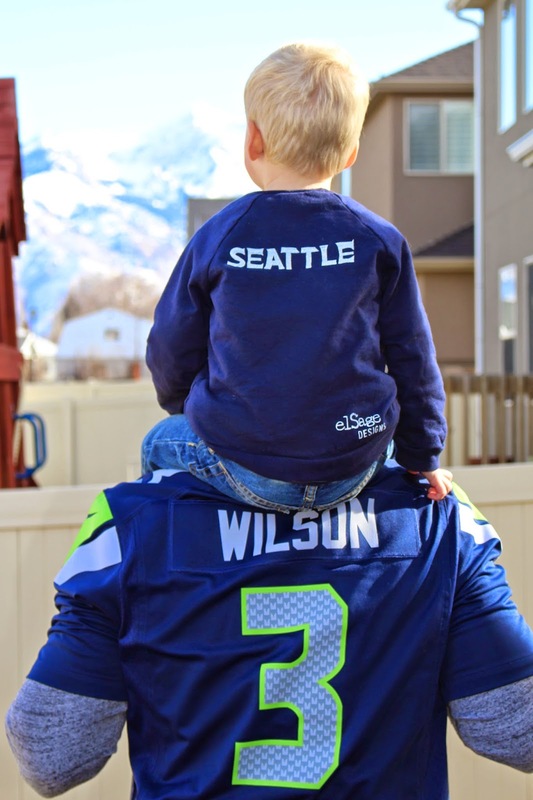 On game days, Liam loves putting on his Russell Wilson jersey (just like Daddy's) and his game face! 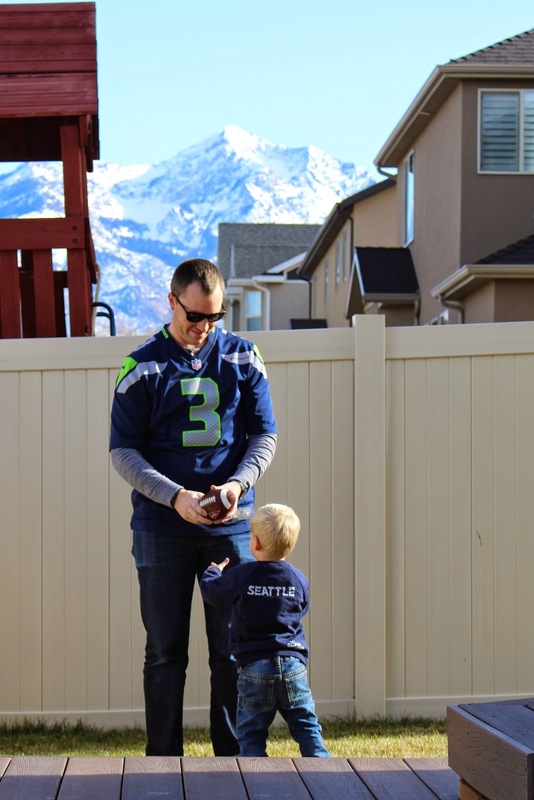 I love his spontaneous "Go Seahawks" or sometimes just "go football"! Sunday was a beautifully sunny day, so we took the opportunity to play around outside before nap time! Liam's coordination is always improving, and I would say that we are close to actually being able to play "catch"! At least his catching is far better than his throwing.... I'm not sure we have a future quarter back among us, but perhaps it is too early to tell! He loves watching Conor & I throw the ball around, and every once in awhile Liam will hike it! He is at that perfect age where he loves learning new things and is incredibly impressionable! Right now we are trying to slowly introduce him to a variety of sports, so we can see where his skills & interests lie. Sports were such a huge part of both Conor & my childhoods, so we want those same experiences for Liam. Please please please let our child be athletic!!! Just this winter we've already taken him ice skating and gotten him on a pair of skis! He obviously loves football and has recently gotten into basketball as well. He has a small nerf hoop (and one in the tub too), but I think this Spring we will be upgrade to the real deal! We have an RV pad on the side of our house that will be perfect for Liam's first basketball hoop! He'll be starting some pick up games before we know it! 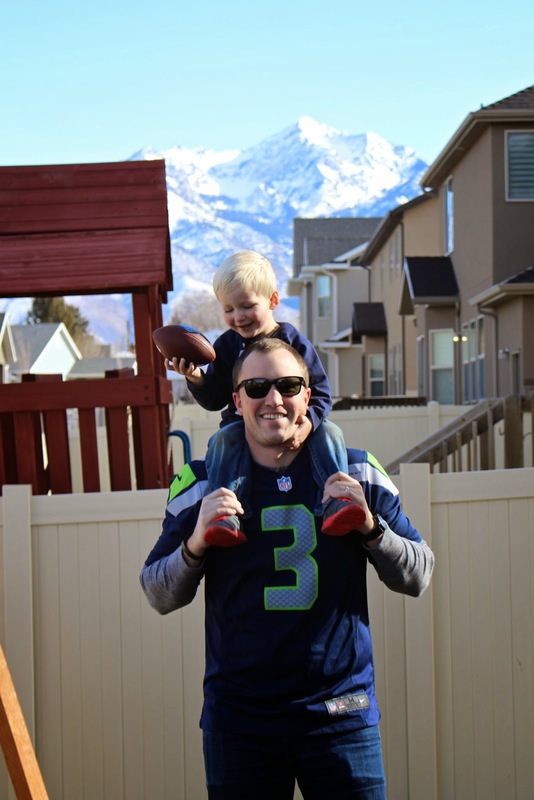 Liam will rocking all of his Seahawks gear for the next two weeks as we prepare for the Super Bowl again!!! Go Hawks! We will be cheering on the Seahawks this year too! Liam is beyond cute in his jersey! I'm not athletic but I'm glad so far it seems Noah is taking after Chris. He can throw pretty well and catch if you are kind of close to him. It makes Chris so happy. Chris' dad was a high school coach for many years so I hope the two of them will coach Noah's teams as he grows up! Kids in organized sports can be the cutest thing in the world! WOOHOO Seahawks! My husband and I were both always really involved in sports (and still like to play) so I always hope our future children will be athletic, too!! Some of my best memories are from sports teams :) Can't wait to see what Liam ends up loving! Chris and I are both totally untalented in the sports department although Chris played all sorts in school. I have my fingers crossed Aria will love something sporty. I have visions of cheering from the sidelines and victory pizza parties! Love his coy little smile in those first few pictures. It's so much fun to watch not only their motor skills develop but also their personalities to determine what they lean towards in sports. That first pick up game of basketball will be so joyful!!! Oh my gosh, too cute!! 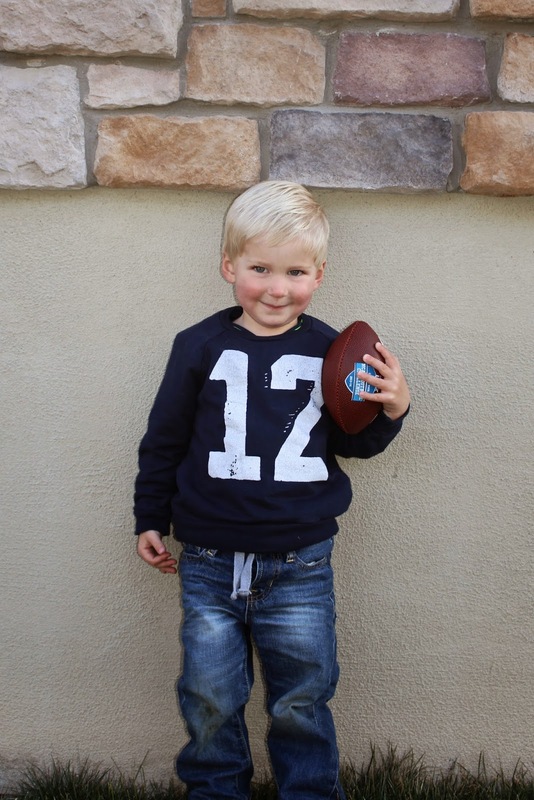 It's going to be so fun as he grows to get involved with sports and be his #1 cheerleader! I love it! So cute!!! My brothers grew up playing baseball & I have so many fun memories of going to watch them!!! Love it - we too are hoping for little athletes as it's such a big part of our lives. Thankfully we've been impressed by T's skills so far. :) Sounds like Liam is on the right track too. It's the best watching them accomplish new athletic skills and enjoy sports! !